Fidel Castro's estranged sister has hit out at the celebrations that have been taking place in Miami following news of the Cuban leader's poor health. Members of the exile community have taken to the streets since Monday's news that power was being temporarily handed to Mr Castro's brother, Raul. Echoing officials, Juanita Castro said she had heard her brother was stable. 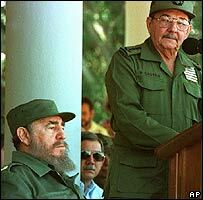 Neither Mr Castro nor his brother have appeared in public this week, fuelling speculation about the island's future. The BBC's Stephen Gibbs in Havana says the situation in Cuba is calm, but security has increased. Ms Castro, who has been in exile in the US since the 1960s, told the BBC from Miami that she thought images of celebrations in the city were damaging "the cause, the country and the exiles". 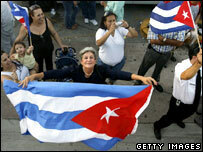 President Castro's younger sister said it was time to stop the hate. While some people in Miami believe the Cuban leader is dead, she says she has heard from sources close to her brother that he is out of intensive care and in a stable condition. Her comments follow those of Cuba's parliamentary speaker, Ricardo Alarcon, who said Mr Castro was "very alive and very alert" after surgery for intestinal bleeding. Ricardo Alarcon told a US radio station he had met Mr Castro on Monday and discussed the impact of his ill-health on the country. He said he had also spoken to him on Tuesday. "He is perfectly conscious, very good speech as always," he said. "We talked for over a half an hour on many things going on in the world, the impact that the announcement has had." He expected Mr Castro to have a "normal period of recovery" after his surgery, he added. Our correspondent says there are growing questions in Havana as to the whereabouts of Raul Castro. Although for the last two days the Cuban defence minister has been the acting president, he has made no public appearances and released no statements. As far as most Cubans see it, it is still his elder brother, Fidel, who is in charge here albeit from his sick bed, our correspondent adds. Cuban state TV earlier has quoted Fidel Castro himself as saying in a statement that he felt "fine". Earlier the Cuban leader, who turns 80 this month, was quoted as saying that a punishing schedule in recent weeks had affected his health. It is not clear whether he is in hospital or recovering at home. This is the first time Mr Castro has relinquished any of his duties as head of the communist state since he came to power in 1959. Fidel Castro has been among the world's longest-ruling leaders, outlasting nine US presidents.